Who or what becomes the image of God? Is it mankind (a collective noun) that is the image of God or is it each individual male and female? What does it mean to be the image of God? The first question is essentially a grammatical one and the easiest to address. The second is very complex and has no easy answer so we’ll leave that one to the next post. NOTE: In the following translation, the relevant nouns that are marked with the (ms) or (mp) superscript 2)ms = masculine singular, mp = masculine plural to make the task of finding the antecedent of the two indefinite pronouns easier. And God created mankind(ms) as His image. As an image of God He created it(ms). Once again, this is a simple problem of determining the correct antecedent of the two indefinite pronouns – ‘it’ in the second line and ‘them’ in the third line. And it is a simple problem. First, ‘mankind’ is the only choice for the antecedent of ‘it’ For example, ‘mankind’, like ‘flock’, is a collective noun and can be parsed as either a plural or singular noun depending on the author’s intention. In this case, the author meant ‘mankind’ to be understood as a singular noun, like “flock of birds” or “herd of cattle”. By contrast, note that the second indefinite pronoun in the third line, ‘them’, is plural and must refer to the collection of humans composed of males and females. In other words, the grammar of the verse indicates that mankind, not the individual humans, constitute the image of God. By way of explanation, perhaps an analogy will clarify. 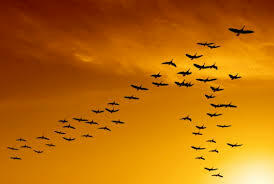 Flocks of geese in flight often arrange themselves in the shape (or image) of an arrow. So, while we might describe such a flock as the image of an arrow, we would not claim that any individual member of the flock looked like an arrow. Correctly interpreted, this is exactly what the grammar of the first two lines of 1:27 reveal. The collective, mankind, is the image of God – not the individual human. This actually makes sense when viewed in the context of Genesis 2:24 and the idea that marriage is a reunification of sorts between male and female to form “one flesh” and thereby reconstitute the image God. According to this interpretation, the institution of marriage in 2:24 constitutes the image of God, not the individual husband or wife3)As far as I have been able to learn, this is a view held by a number of scholars, though certainly not the majority.. While the grammatical view is perfectly reasonable, Genesis 5:1-3 confounds this interpretation. …When God created mankind, he made it in the likeness of God. Male and female he created them, and he blessed them and called them “mankind” when they were created. 3 When Adam had lived one hundred thirty years, he became the father of a son in his likeness, according to his image, and named him Seth. What’s going on here? In this verse, the singular noun, son, is described as being the image and likeness of his father! One [unsatisfactory4)to me, anyway] explanation is that Seth, having been the product of the union of Adam and Eve, constituted an image and likeness of mankind because he bears both maternal and paternal elements5)In the language of modern-day biology, Seth contains roughly equal amounts of maternal and paternal DNA. This has some support from Genesis 2:24 in that some scholars (but by no means the majority) believe that “one flesh” refers to the child as representing the reunification of the male and female – a reconstituted mankind if you will)). Since the initial couple (in both Genesis creation stories) were not created biologically but divinely they would not be considered to have been made in God’s image and likeness. So, if this explanation is correct, each human born of the union of a man and a women (i.e., everyone), does, in fact, constitute an image of God. 3. ↑ As far as I have been able to learn, this is a view held by a number of scholars, though certainly not the majority. This entry was posted in Bible Culture, Biblical exegesis, Biblical Hebrew, Grammar, Hebrew. Bookmark the permalink.